Captain Hadrian Allan Sawback and the crew of the Willful Child are back in another series of adventures! This time, the lovingly done Star Trek spoof that happens to also be an exciting and clever space opera in its own right, takes on: a giant piece of alien tech out to end the world, idiotic time agents messing with the timeline in an attempt to keep Sawback from messing with it, a planet of literal consumer drones, revenge from several quarters, and more. 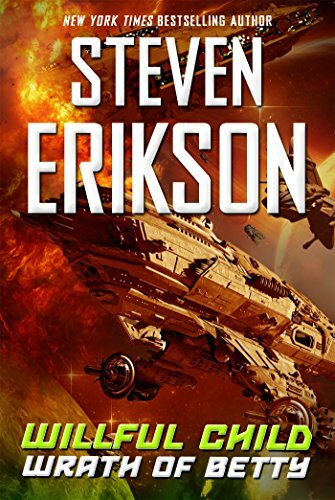 The ship is constantly encountering strange new worlds in strange new ways, and having to deal with the things they find there—often by blowing them up or karate chopping them. Also this time, it seems as if the series is finding its feet. Sawback comes across as less accidental and more intentional. It's his mission to not only fulfill his duties and perform his missions, but also to bring a halt to the ongoing dumbing-down of humanity. The fact that it's a self-chosen mission that makes him the target of spying and mutiny only ups the madcap excitement. His crew is still a mess of neuroses, but there's a point to them, they're shown to be generally competent despite them most of the time, and they were chosen because they're good at their jobs, sometimes inexplicably. Even Tammy, the rogue AI from the future that kidnapped the ship in the first book, is learning that there's more to this ship, its captain, and its crew than we previously thought. The book reads like a season of a show, and does a good job of treating this second book the way a second season of a show should be: building on the original framework, fleshing out the characters, and expanding the world in sometimes unexpected directions. Willful Child continues to make the occasional joke about it's show-like-ness, but now that the tone and structure were set for them in book one, the story can stretch out a little. It's slightly less episodic and a little more ongoing. It's a little more complex and sincere, though equally as irreverent. It makes gentle commentary on conventions and fan culture, while also poking fun at Star Wars (which, as it's meant to be like Star Trek, is almost required). There are many, many points where Willful Child the book, if not the ship, will make any fan of either giggle a little as they get the references, though not knowing all the details of the source being spoofed shouldn't hurt the fun of reading it. If these books are as interesting and fun to write as they are to read, I hope there are many more to come!